Why does “ls -all” show time for some files but only year for others? 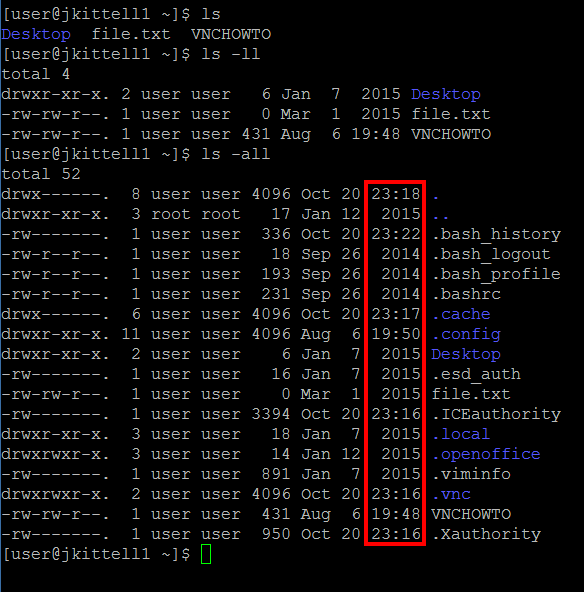 If you issue ls -all command some files or directories have the year and some have the time? Why do some show the year while others show the time? Is the time representative of the time the file was created? By default, file timestamps are listed in abbreviated form, using a date like ‘Mar 30 2002’ for non-recent timestamps, and a date-without-year and time like ‘Mar 30 23:45’ for recent timestamps. This format can change depending on the current locale as detailed below. The time represented is modification time. Please note that ls -all is the same thing as ls -l -a, which is different from ls --all. There is no reason to use double l in your example. If you want to see the modification time for each file, you can use ls -al --full-time. If the date/time that it is trying to display is in the past six months, ls displays the date and the time. If it's longer ago than six months — or if it's in the future — ls displays the date and the year. ls -all is equivalent to ls -al, which is equivalent to ls -a -l, ls -l -a, and ls -la. -u is also specified, in which case it displays access time. See ls(1) for more information. This output is tuned for maximal information content: when the time is "close enough" to the current time (not entirely sure, but I'm guessing within six months) the year is elided and the time of day shown instead. Otherwise, the year is shown. This is the default mostly because you likely don't care as much about the precise time-of-day something was modified, if that time is years ago. GNU coreutils ls has the --time-style option, to control this explicitly. Have you realized something? It just appear the hour time on 20 October, which is today, that means that it will show the last time you modified the file, but, in other days which aren't today, it will only show the date without the time. It turns out that it is not this, as answered by Thomas. I just tried to use the deduction method, not assured to have a correct conclusion after all. Not the answer you're looking for? Browse other questions tagged ls or ask your own question. Why doesn't ls -l show the time and or year for every file? Why is my files “last modified” timestamp only showing the year with the 'ls' command? Why is sorting files by access time not working? Why does “ls . *” show the contents of hidden directories? How to show all files with some filters?